- Win over networkers from other companies to join YOU! My goal is this: I want you to profit as much as possible from the information in this book. And if what I write here can save you time and money (on training), I would have done my job. Ponder for a moment: If the knowledge here would equip you well enough to close that ONE BIG SALE (or finding your next superstar downline) would you be overjoyed? Similarly, wouldn’t it would be a great shame, if you didn’t know better, and at that time, you lacked the confidence to sponsor that same person due to lack of knowledge? Words cannot describe the feeling of loss if that were to happen to me. Don’t leave home without this knowledge! And the best thing is, if you know all this stuff better than me, then PASS THEM TO YOUR DOWNLINES! You cannot lose! This was quoted by a famous war general. How does it apply here? Just as no two people can truly be the same, it is very rare that plans in two different companies can be designed exactly the same arrow by arrow. Let me establish some facts first. If you were given a choice, would you rather sponsor someone who doesn’t know network marketing or someone familiar with network marketing? The reason most people would choose the second option is simple, you don’t need to spend so much time training them and they would bring results well on their own. Now where would I find these types of people? Of course, in other network marketing companies! But it is not that simple to get those guys over. In life, however, there are no guarantees. You will never know when circumstances will change, when that person might have fallout with his upline or his company might collapse and they might just be hunting for THAT one new opportunity to bring their people to. Timing is important! Now, some networkers might not agree with me that people might join a new company because of a superior plan. They say it is because of the leadership, influence or confidence that the upline projects. Now I don’t disagree with them. But consider this, how can you be confident, influential or a good leader without thorough knowledge of the plans in the industry? And, if the prospect happens to be obsessed with marketing plans, saying the right word at the right time would nab you a sale! Now that we have set the record straight, knowing your plan and their plan well will bring you one step to closing a new sale or sponsoring a new distributor from another company. You may think pinching other people from other companies might be unethical, but this is a dog eat dog world we live in. Given the chance, I believe ‘they’ would love to pinch your downlines as well. (DO NOT attempt this WITHIN your company as line pinching in the same company can often lead to termination of your distributorship) I am not running a course on ethics here; it is up to you to decide what is best for your business. But my belief is this: if I believe my company offers a better product and opportunity to earn income, I would recruit other networkers. Competition is good for companies anyway. Equally important also, I don’t want to lose my downlines to other networkers as well. Of course, if they decide to leave for whatever reasons, I won’t hold them back because it is THEIR business, not mine. But I want to make sure they don’t get pulled over because of my incompetence as a leader and lose my source of income as a result. This usually occurs when the upline leader is ineffective and deserves to lose his downlines to other networkers because they never trained them well enough in the first place. Each plan will be explained in a few sub-headings. There is a diagram associated with each plan. This will explain how the commissions are paid out, as well as the typical network building strategies. I will also illustrate typically what type of companies use this kind of plan structure. Plan advantages are very crucial to build a long term business. If you haven’t decided which network marketing company to join, or you are thinking of moving to another company (for whatever reasons), this information will give you a very good idea how to build your downline, especially if you are moving your entire network to another company. Not all plans are created equal. There will always be aspects where some plans excel where others don’t. 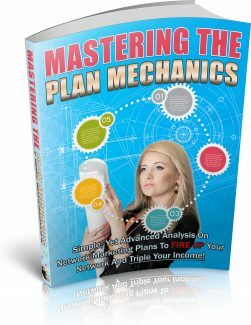 Furthermore, as mentioned in the chapter above, you know where the weak points of other network marketing plans lie and you can use them to your advantage. NOTE: All plans illustrated here are presented in the rawest form and for you to understand and dissect the basic concepts. The information here is designed to guide only, not as a law. There are many hybrids and variations available in the market today. What I write here is the basic, fundamental structure of where most plans derive their ideas from. Check with your upline or company to be 100% PRECISE about your company’s plan. The Unilevel plan is one of the oldest types of plans in the market. It basically allows you to sponsor as many people as you want at your level. According to the diagram, there are six people on your ‘frontline’ and more can be sponsored as you like. Your downlines can also sponsor as deep as they want until infinity levels with no restrictions.